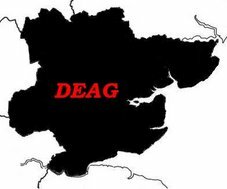 Yesterday's Darkest Essex continued the current trend; we had current cake and discussed DCC amongst the other mixture around the table. Henk was visiting, and brought a few things with him; computer generated brickwork, laser cut card wheels, the most complicated crossing assembly I've seen in some time and some DCC bits and pieces. The DCC included a few DCX74 decoders, possibly the smallest around at present. Henk's DCC system is based upon that used by Fremo; uses LocoNet (Digitrax) for the networking between throttles, and is based on an Intellibox command station and a number of Fred throttles. Fred is available either commercially from Uhlenbrock, or as a DIY kit for Fremo members. Intellibox, also from Uhlenbrock, is a very capable command station and booster, can handle numerous formats (some now obselete), and is upgradable with firmware changes. But its quite expensive, and arguably over-kill for many smaller layout owners. Hence to DIY versions. Henk mentioned the MiniBox, this being a DIY command station, designed to be used with Fred and other LocoNet throttles. MiniBox is described on Pal Olsen's site.